Sierra - Class of 2018! BlushTones is an award-winning makeup artistry team based out of Virginia Beach specializing in airbrush makeup. Leah Laviano, owner and master artist, wanted photos that really show cased her new studio in Virginia Beach. She recently moved to a new studio and has spent the past couple of months adding in her decor and personal touches. Leah wanted to bring me in once she perfected it (she’s definitely a perfectionist but it shows!) The new studio is GORGEOUS. It’s full of bright, white light and huge mirrors. 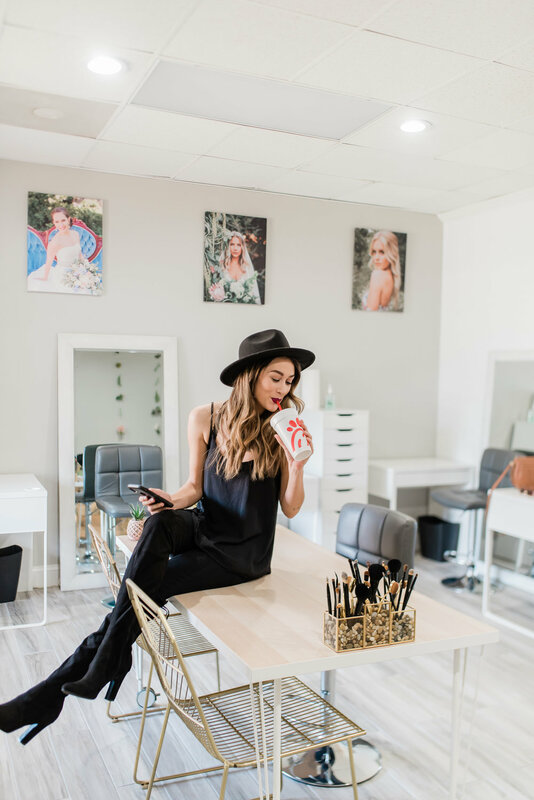 The seats that her clients sit in are super comfy and the studio as a whole has a very clean and modern look. I think she’s hit today’s trends head on. 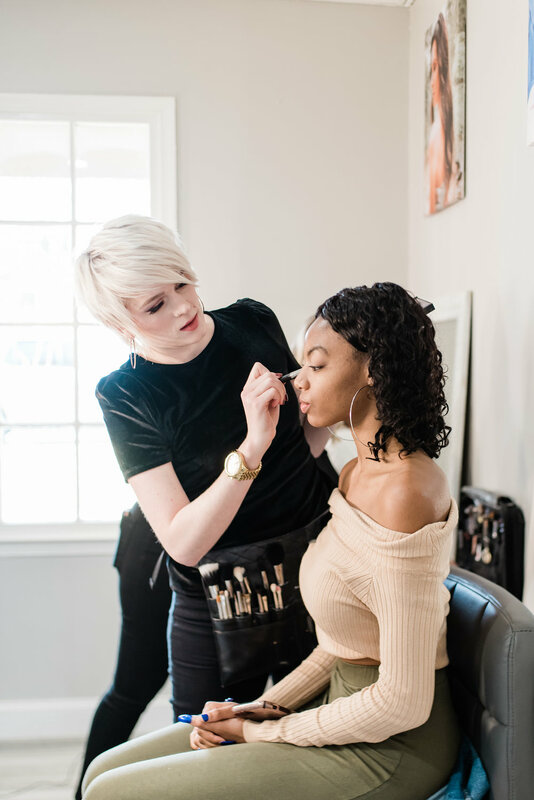 We really wanted to encompass the entire studio so we made sure we got wide shots, detail shots of makeup products, other makeup artists working on their models and Leah’s personality shots! 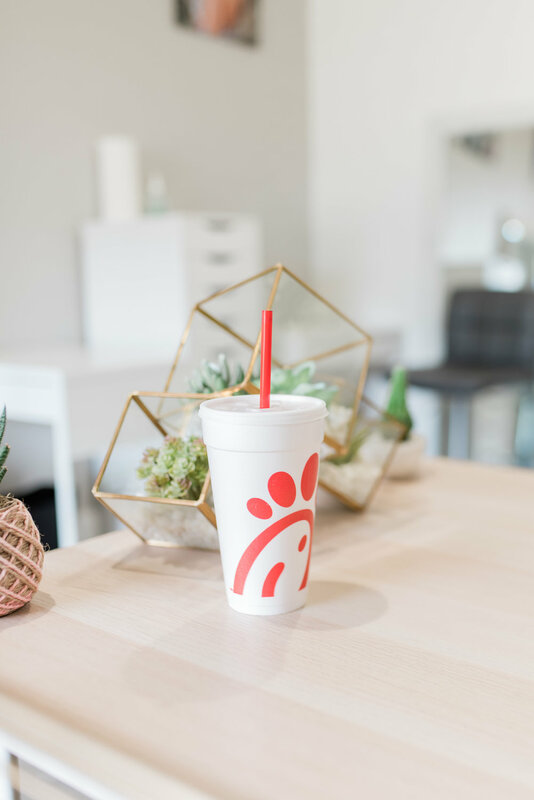 Leah loves Chic-Fil-A and she just so happened to have some with her during our shoot (perfect timing!!) I definitely took advantage of that and told her to get on the table and pose with her Chic-Fil-A cup! She didn’t fight me on this idea. 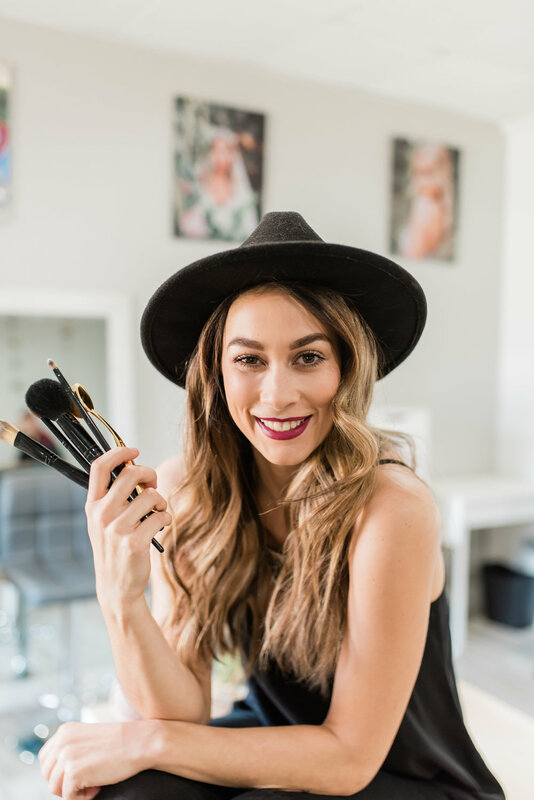 Leah’s makeup artists are more than just girls working at a makeup studio. They all work together beautifully and act like a family, trust me I’ve seen it! This is so important when you’re working with them for a wedding. It’s a beautiful thing when everyone gets along so well. Everyone there is equally talented and I don’t think anyone would be disappointed in booking any single makeup artist. Follow them on Instagram @blushtones or check them out HERE. You can also book discounted services done in their gorgeous studio HERE. 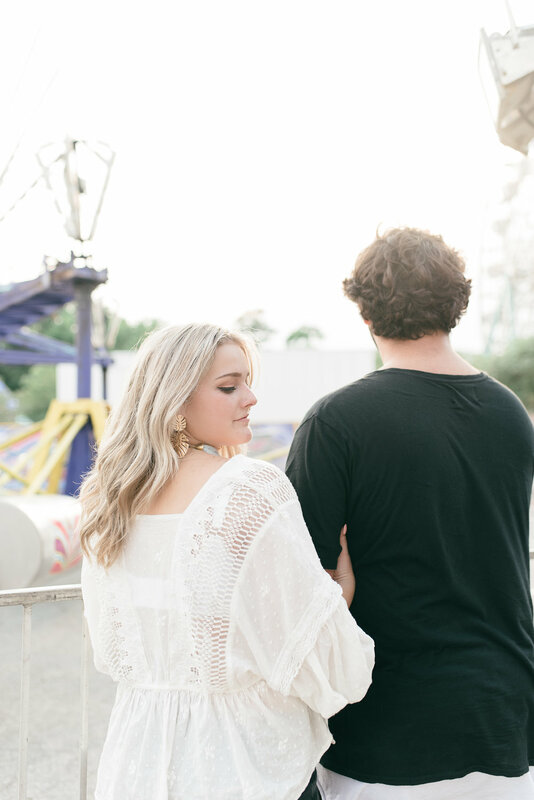 An engagement session at the First Landing skate park in Virginia Beach. Ashton and Madison were the much deserved winners of my engagement session giveaway! They told me about how their first engagement session didn’t completely go as planned so I was excited to deliver Madison her dream photos. Their session was in First Landing state park in Virginia beach. The forecast a few days before had us a little worried about rain but my instinct to not exactly trust the weather report didn’t let us reschedule the session. The weather ended up being incredible. We were blessed with sunlight, some cloudy weather, and a sunset throughout the engagement shoot. Once we got there, we took a long walk to get to the area that Madison and Ashton envisioned in their head. From there, we took photos as we made our way back to our cars. I like to start far and slowly make my way back to where we began, it really helps with our we use our session time. 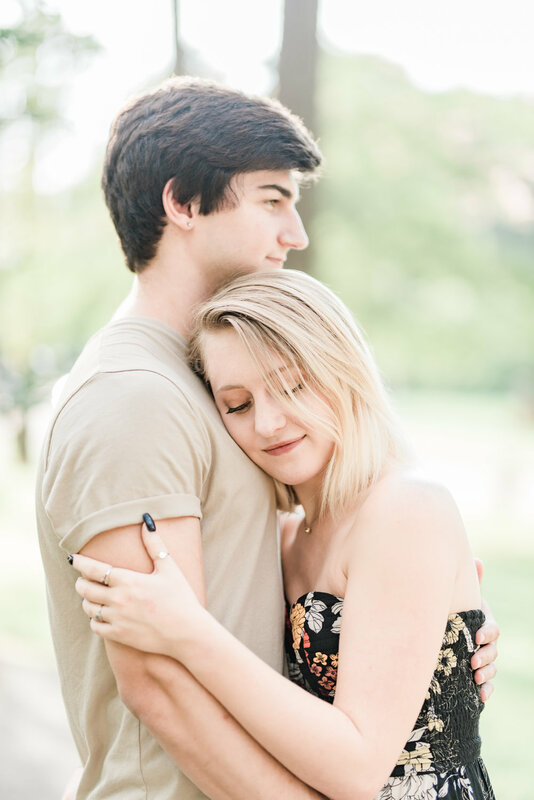 I also took this time to get to know Madison and Ashton, getting to know my couples is honestly one of my favorite parts about being a photographer. Every client is so unique and has a totally different story. Ashton and Madison told me they met through mutual friends and the rest is history. They took a vacation overseas a while ago and Madison told me that she was sure Ashton was going to propose to her. She even got a manicure to make sure she was ready! Luckily, Ashton had something even more romantic in mind. He ended up not proposing during that vacation which completely threw Madison off. BUT Ashton took her camping in the mountains and popped the question. Instead of roughing it in the woods, he took her to a charming resort to celebrate. That sounded like the perfect surprise to me! I loved hearing about it. Everything they told me about their relationship is so sincere and is close to their roots. Congratulations Madison and Ashton, I can’t wait to see how your wedding day comes out. Ruby & Tyler have known each other for a 15 years. They met as classmates, then were high school sweethearts, just friends in college, pen pals post grad, to a rekindled romance, to roommates, to soon to be married! 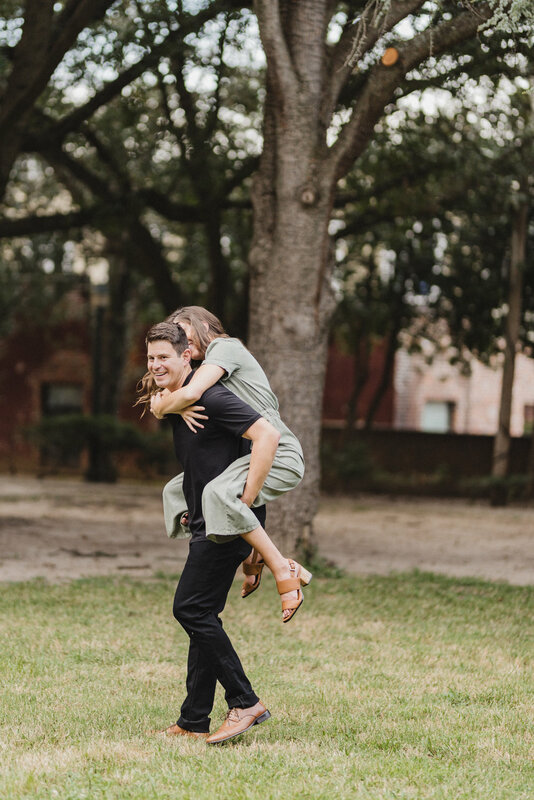 Their engagement session was shot in Church hill. Ruby knew exactly where she wanted photos to take place, and even sent me a map of all of the locations! We started at this brick wall, moved to a woodsy area, a pink garage door, and ended up at one of their favorite bars. It was a whole adventure that we somehow shoved into an hour. One of my favorite parts of the shoot was that Ruby brought some wine!! Ruby’s favorite date happened on the first valentine’s day that they lived together. They stayed home, bought really nice wine, and steaks. They both cooked the best steaks they’ve ever had in their cute little apartment, enjoying each other’s company. Sometimes, it really it about the simple things. Tyler’s favorite date was their first date after Ruby moved back from France. Tyler look her to a little tapas place called Bar Pintxo. Even though it was so casual, he thought Ruby looked so beautiful (which isn’t hard to do for Ruby!). This was just a pink garage we walked by but some of my favorite photos from that night were taken right in front of it! Congratulations Tyler & Ruby, I CANNOT wait to shoot your wedding in 2019! Madison reached out to me a little while ago saying she wanted to do a couples session with her and her boyfriend. I was so excited because 1. I can’t get enough of Madison and 2. I was excited to meet her boyfriend finally. They drove down to Virginia Beach from Yorktown that day and met me at Red Wing Park. It’s been so long since I had a session there so I was glad to be back! Madison and Alec met during high school. He used to wrestle and she would attend meets to see her brother, so she always knew of him through that. They didn’t officially meet until Alec took her on a date to see Christmas Lights. Alec and Madison have so much in common too! It’s amazing when you’re able to find someone with the same life goals and humor as one another and that’s exactly the case for them. Madison said there’s not a day that goes by that they don’t make each other laugh. I met Katelyn while working with her at Platos Closet. We ended up becoming good friends through that and a few years later here we are! I don't think I've met anyone with style as good as her or anyone as bright and welcoming. Katelyn met Brandon on Tinder! At first he just wanted to be friends but then he had a bad day one day and Katelyn surprised him with a pizza delivered to his house. After that, things were different! Katelyn said Williamsburg was probably one of their favorite dates that they've been on. They took the whole day and walked around colonial Williamsburg, went to the bakery, stopped at a brewery, and ended the day at the outlets. They both love discovering new places and particularly enjoy watching the office and anything sports related. 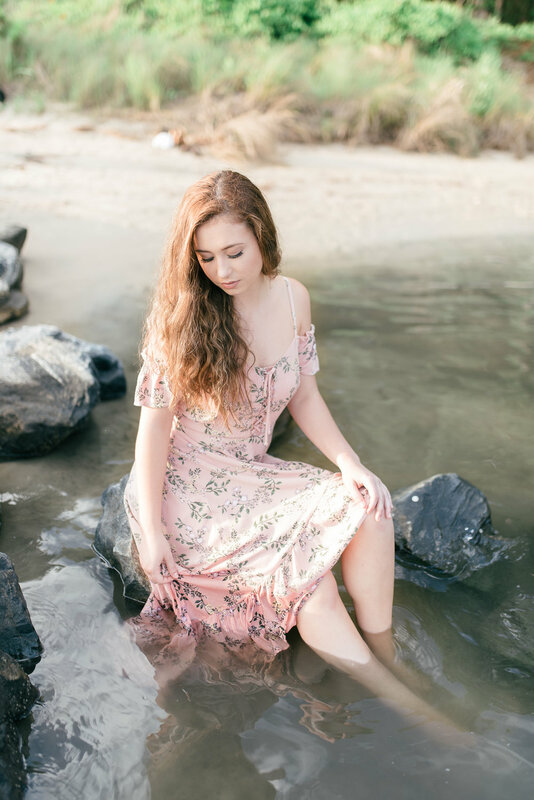 Here are some photos from our mini session together. I don't know about you but these photos make my heart melt!! I'm so thankful I met Katelyn and that she introduced me to Brandon too! How are today's high schoolers so gorgeous? I can't figure it out! 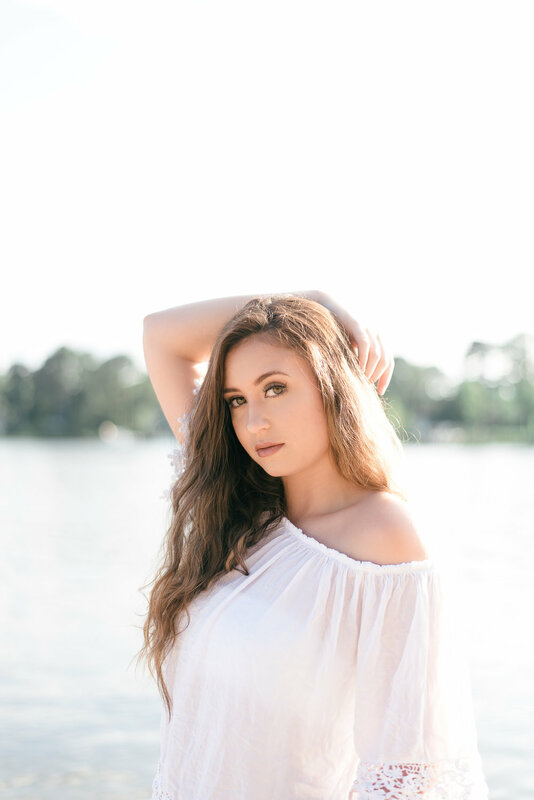 I recently did a senior shoot with Sierra, and let me tell you - I couldn't believe she wasn't a signed model!! I barely had to direct her. 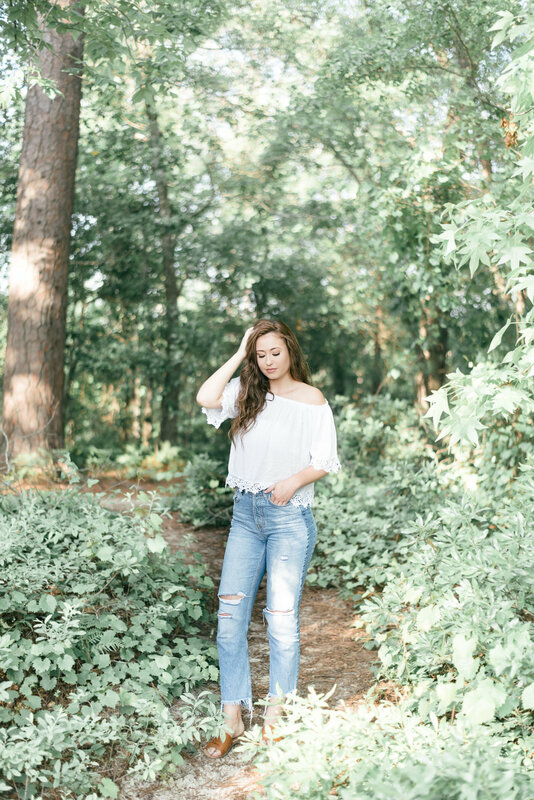 Sierra was homeschooled and went into class two days a week, that sounds so much better than my high school experience waking up every morning at 6 am! Sierra is going to Southern Adventist University this coming fall for four years to study biology. During her sophomore year she plans on traveling abroad to study, she hopes it's somewhere in Europe! After Sierra graduates, she hopes to go to medical school in California to specialize in cardiology. That sounds like a long and eventful journey, I can't wait to see where her future takes her! Here's some photos from our shoot! Her makeup was done by Meg Bryan!